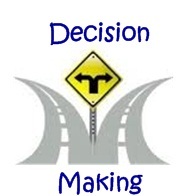 Decision making is a process that involves the collection and analysis of information which results in the selection of a course of action among several alternatives. Effective decision making may require a great deal of time, energy, thought, and information. But hopefully, the process produces a final choice which will be the best one to produce the desired results. People make decisions of varying importance every day. A decision is simply a choice between two or more alternatives. If we only have one alternative, we do not have a decision. Some of those decisions we make require very little thought such as choosing what to have for lunch or what shirt to wear. However, other decisions require much more thought such as which house to purchase or which college to attend. Most people use some type of decision making method when making bigger decisions on matters of importance or consequence. Although the process takes time and effort, the benefit is that the process sufficiently reduces uncertainty and doubt about alternatives to allow a reasonable choice to be made. Our program provides strategies and tools to help individuals and teams make better decisions.